Barbovschi, M., Macháčková, H., & Ólafsson, K. (2015). Underage use of social network sites: it’s about friends. Cyberpsychology, Behavior, and Social Networking, 18(6), 328-332. Mascheroni, G. and Haddon, L. (2015). Children, risks and the mobile internet. In Y. Zheng (Ed. ), Encyclopedia of Mobile Phone Behavior (pp.1409-1418). Hershey PA: IGI Global. Mascheroni, G., Vincent, J., & Jimenez, E. (2015). “Girls are addicted to likes so they post semi-naked selfies”: Peer mediation, normativity and the construction of identity online. Cyberpsychology: Journal of Psychosocial Research on Cyberspace, 9(1), article 5. O’Nell, B. & Dinh, T. (2015). Mobile technologies and the incidence of cyberbullying in seven European countries: Findings from Net Children Go Mobile. Societies 5, 384-398. Ponte, C., & Simões, A. (2015). Comportamentos online de crianças e jovens portugueses.In M. Guilhermina Lobato (ed. ), Psicologia dos Comportamentos Online (51-80). Lisboa: Relógio d´água. Mascheroni, G. (2015). 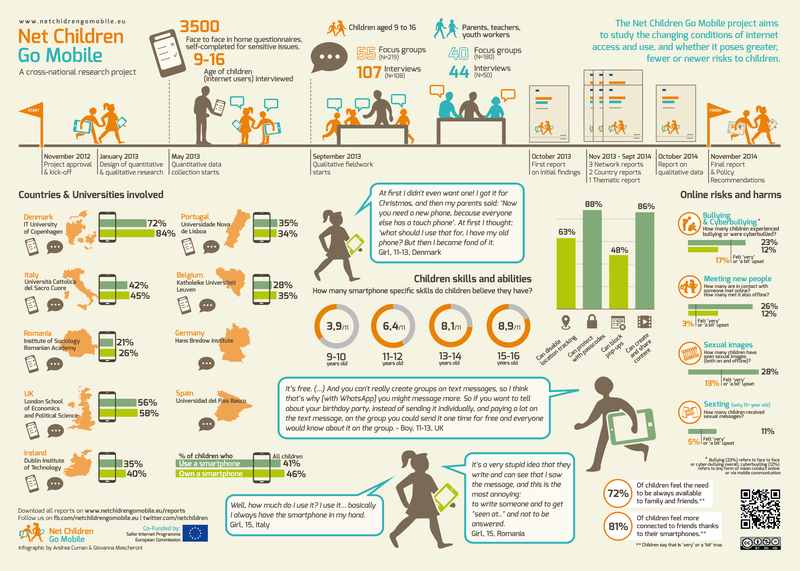 The experience of EU Kids Online and Net Children Go Mobile in Europe and beyond. Lessons from research and future challenges. Policies and Initiatives to Promote Children’s Safe, Effective, and Responsible Use of ICT: Asia Pacific Regional Consultation 9-11 September 2015; Bangkok, Thailand.